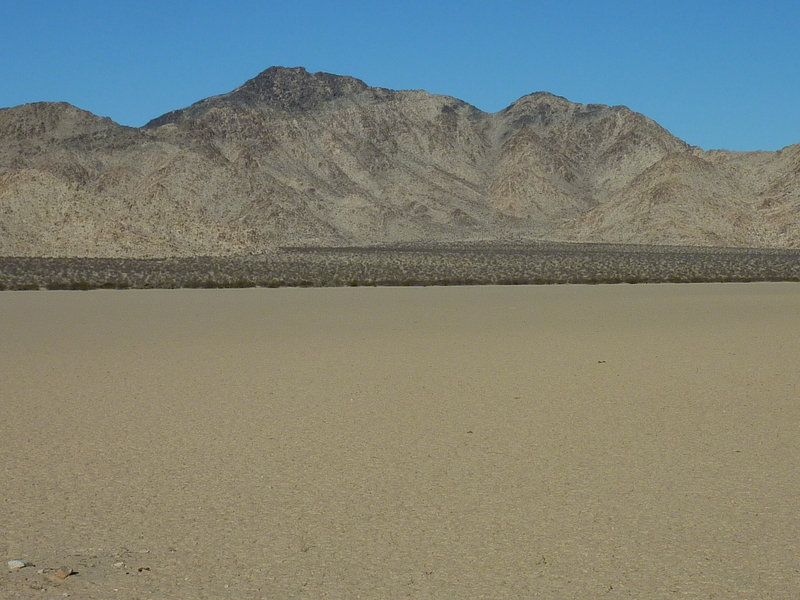 The Sheephole Valley Wilderness is found just north of SR62 and Joshua Tree NP in the Mojave Desert. It comprises two ranges, the Sheephole Mtns to the west and the Calumet Mtns to the east with the expansive valley for which the Wilderness takes its name running down the middle, roughly north-south. There are three summits with more than 900ft of prominence between the two ranges. The tallest of these at 4,600ft is the highpoint of the Sheephole Mountains and a DPS peak, one I had visited nine years earlier. Today I was after the other two, including the highpoint of the Calumet Mountains. Between the two ranges is a small cluster of lower hills that were more or less on my way between the two summits of interest and so I made plans to ascend the highest of these as a bonus. I started directly from the pavement of SR62 where the highway makes a bend to the southeast. Because of the Wilderness boundary directly north of the road, one can't legally get any closer to either summit even with 4WD. This was to be a long outing, more than 20mi in length, but even with the shorter days of fall it would not take all the available daylight. Though my primary purpose in these ramblings is to climb mountains, today's effort would involve hours upon hours of walking across flat desert. When I started out from a call box at the turnout along SR62 shortly before 7a, I had some 5.5mi of flat desert walking before a final climb of less than half a mile. The desert here is compacted sand and gravel with a modest amount of desert scrub and almost nothing with sharp needles, making for a very pleasant outing. There are a few old roads criss-crossing Sheephole Valley, but no vehicles to exercise upon them (though there was at least one truck that looks to have recently driven in and back out judging by the tread marks found on the sandy roadbed). I followed one such road northwest, leading me to mile and a half-long dry lakebed situated along the east side of the Sheephole Mtns. The ground was sun-baked mud, punctuated only with the rusting detritus of some mining operations that were once active in the area. Across this low spot I began a slow uphill gradient, aiming for a wash on the east side of Peak 2,995ft. The summit can be identified by black-colored rock that constitutes its upper few hundred feet. Though it appears to present a very steep eastern face, upon closer inspection the slope isn't all that great and it can be climbed from any aspect at no more than class 3. I had originally intended to follow one of the washes up to a saddle and climb to the summit via the SE Ridge, but as I neared the mountain I decided the direct approach up the East Face would be both faster and better scrambling. The rock was composed chiefly of crumbly granite, the kind that makes for better sand than good climbing. Ascending was an easier task since a broken foothold had fewer consequences than while descending. For the most part the rock held together and the leather gloves I wore kept my fingers from getting worn down. It was now growing warm and the elevation gain was making me sweat more. I had brought three quarts of Gatorade which proved just enough - 4qts would have had me better hydrated (but more weight to carry) whereas two would have left me scrimping and quite thirsty. It was 9a before I hauled myself up to the highest point on the mountain. A large rock cairn had been constructed there by persons unknown. I searched the cairn thoroughly for a register of some sort but found none. I wouldn't have expected Vitz to have visited it since it's prominence comes in at less than 1,000ft, but surely MacLeod (later I checked his LoJ log and found he reported climbing it in 1981. Seems he didn't always leave a register on the summits he visited). The views were nice, extending along the length of the Sheephole Mtns to the northwest, east across Sheephole Valley and south into Joshua Tree NP. I took a somewhat different route down, choosing one less steep (and less chance of stumbling) just to the north, returning to the mouth of the wash around 9:30a. Another hour of desert walking across Sheephole Valley followed as I aimed for the highest point I could see in the small clump of rocky hills found in the middle of the valley. A few hares could be seen darting away in the distance on my approach and a few lizards would flit under a rock, but for the most part there was little desert life to see during daylight hours. There were plenty of large holes dug by desert tortoises that I came across, most looking abandoned but a few possibly occupied. Any tortoises were buried too deep inside to get a look at them. The best I could find were some broken shell fragments lying bleached in the sun - some poor fellow had run out of luck in this unforgiving land. As I was climbing up to False Range Peak from the west side, I came across a medium-sized rattlesnake curled up in the shadow of a rock. I was close to stepping on it when I spotted it and jumped back at the surprise. It made no noise, no movement of any kind and didn't seem to be aware of my presence. I took a photo and then tossed a small pebble at it to see if I could illicit a response. Nothing. It just bounced off like it was made of stone. I thought of finding a stick to poke it with, but thought perhaps that might make it use precious energy in an energy-challenged environment. Better to let it use what stores it has for catching mice rather than entertaining me. I had been wondering why I don't see many snakes in the desert and figured it was because of the time of year - they're thinking more of hibernating in the cold weather than anything else. But it was early November and still warm during the day without the very cold nights. I had been expecting to find them warming themselves in the sun, but this one proved otherwise. Perhaps I need to pay more attention to the shadows? This would affect me for the rest of the trip and I found myself looking for snakes in all the shady spots I was scrambling through, taking a little more care than usual to look before putting my hand on a rock. I convinced myself that the gloves I wore would offer some protection and thought perhaps the snakes need to be more wary of me stepping on them than I of getting bit. Luckily there just aren't that many of them to be a big concern and the uneasy truce between the rattlesnakes and I held out for another trip. Less than five minutes after the snake encounter I found myself at the highpoint. Tucked among the summit rocks was a 1980 MacLeod register and it was from this that I got the name of "False Range Peak." I can't really figure out how he and/or Barbara came up with that name, but it was better than Peak XXXX. There had been no other visitors to sign the register in the 34 years it has sat upon the summit. I added my own name just below the three names from Gordon's party, keeping it on the first page. The second page may have another 34 years to wait. Getting to the summit from the west side was certainly easier and shorter than the more convoluted route I found getting over to the east side. There was some up and down and skirting around boulders and brush to get myself onto the correct side, as the natural downhill flow from the summit wants to deposit one down to the south. Once down at the base of the mountain there was another 2.5mi trek across Sheephole Valley to reach the Calumet Mtns. Located between Sheephole and Cadiz Valleys, the highpoint of the Calumet Mtns is most easily reached from the Sheephole side from which I approached. It's about 6/10mi and 1,000ft above the desert floor and like most desert summits can be climbed from any side. The rock for the most part was much like that on the Sheephole Mtns, coarse and crumbly granite, stuff that in a wetter environment would have much sooner been worn down to sand covering the valleys below. There are two summits to the highpoint, the east one being the highest. Knowing this ahead of time, I was able to skirt around the north side of the west summit that I reached first, scrambling down a short ways to the saddle before ascending the east summit. This summit featured a benchmark and another MacLeod register, this one from 1981. As a range highpoint it was far more popular than the other two summits I visited, with some 11 pages filled, though still averaging less than one visit per year. After eating my lunch in sunshine I descended back to the saddle between the summits, then down the south side route as described by Evan Rasmussen in his write-up from 2009. The route doesn't offer any better scrambling, but it's probably the quickest way back to the highway. After returning to the desert floor I still had another hour and a half of walking to get me back to the van. This was the nicest part of the afternoon with temperatures cooling some and the long shadows across the landscape improving the desert's charm. I came across another empty tortoise shell in my wandering, this one mostly intact except for its absent homeowner. Closer to the highway I came across human trash dating back decades - old aluminum cans, broken beer bottles and other refuse from the days before this became a Wilderness in 1994. It wasn't an overwhelming amount of debris, but enough that you can't help notice it amidst the brush and desert terrain. Curious what day-time and night-time temperatures are in the desert in November? Is a sleeping bag sufficient in your van or do you have other heat source? Bob replies: it can vary widely, but I knew ahead of time it wouldn't get below 50F, so a cotton sleeping bag suffices. When it gets below freezing I add a down comforter. Daytime temps were 78-85F. Bob, would you say that the 34-year gap in the MacLeod register was the longest one you have come across in your travels?